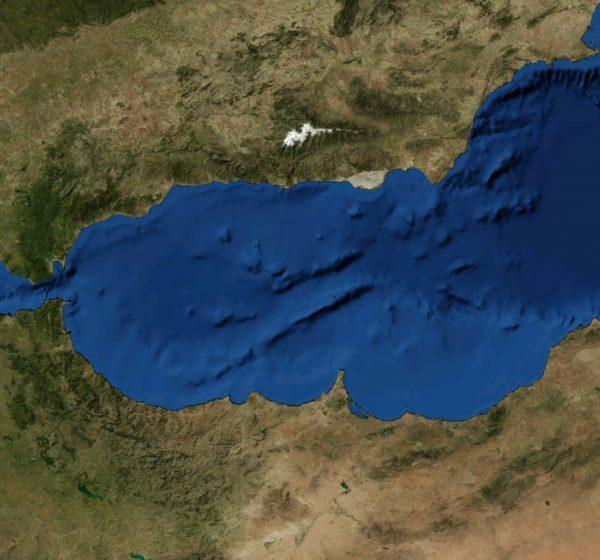 Two sea bed loggings retrieved from the Alboran Sea's basin and analyzed at very high resolution have allowed the reconstruction of climate and oceanographic conditions, as well as the identification of anthropogenic influence in the westernmost region of the Mediterranean Sea over that period. Global warming, climate change and their effects on health and safety are probably the worst threats in mankind's history. Recent reports from the Intergovernmental Panel on Climate Change (IPCC 2007, 2014) have furnished scientific evidence such as that the observed rise in mean ground temperature all over the world from the beginning of the 20th century is probably due to anthropogenic influence. Moreover, global mean concentration of carbon dioxide in the atmosphere has risen since the industrial revolution due to human activities. Said concentration has surpassed that found in ice cores over the last 800 000 years, too. In this regard, in January 2016 the NASA and the United States' NOAA (National Oceanic and Atmospheric Administration) revealed that global mean temperature in 2015 was the highest one since 1880, when we started to record it. With this in mind, a multidisciplinary team of researchers from Germany's Center for Biodiversity and Climate Research (Vanesa Nieto-Moreno), the University of Granada (Miguel Ortega-Huertas), Spain's CSIC (Francisca Martínez-Ruiz, David Gallego-Torres and Santiago Giralt), the Autonomous University of Barcelona (Jordi García-Orellana and Pere Masqué) and Holland's Institute for Marine Research (Jaap Sinninghe Damsté) has carried out a research on the reconstruction of climate and oceanographic conditions in the westernmost region of the Mediterranean Sea. For that purpose, they have used marine sediments retrieved from the Alboran Sea's basin. The studied region is very interesting, since it's specially sensitive and vulnerable to anthropogenic and climate forcing due to it being a semi-closed basin located in a latitude affected by several climate types. Several organic and inorganic geochemical indicators have been integrated in the model for this research, thus deducing climate variables such as sea surface temperature, humidity, changes in vegetation cover, changes in sea currents and human impact. In contrast, the negative phase is associated with opposite conditions during the Little Ice Age and the industrial period. Our records show that, during NAO prolonged negative phases (1450 and 1950 A.C.), there occurred a weakening of the thermohaline circulation and a reduction of "upwelling" events (emergence of colder, more nutrient-rich waters). Anthropogenic influence shows up in the unprecedented increase of temperature, progressive aridification and soil erosion, and an increase of polluting elements since the industrial period. On a broad scale, atmospheric circulation patterns, oceanic circulation patterns (the NAO and the Atlantic meridional overturning circulation), and variations in solar irradiance seem to have played a key role during the last millennium.